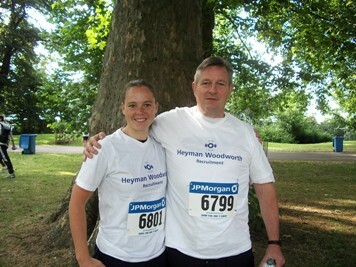 The Heyman Woodworth four man team burned up the 5.6km (3.5mile) Battersea Park course in a team time of 2hours and 5 seconds. The atmosphere was fantastic. Team camaraderie was also a highlight. There were lots of people out there running, who wouldn’t normally be doing so, including us! A sold-out crowd of 12,930 participants from 302 companies joined us at the starting line. It was a great social event that got us running for charity and SportsAid, the organisation that provides financial and training assistance in the development of young athletes. It was good to be out in the sunshine, bringing the office into Battersea Park and raising some awareness for ex-Forces Officers.